The 1184HD is a heavy-duty hold open device, which ensures that your roll-up door stays open while in use. Using a hold open device can help decrease incidents of door damage and staff injuries, by stopping the door from unrolling and hitting the frame or staff. It can also prevent cargo from being damaged while loading, thus reducing delayed shipments and lost revenue. The 1184HD offers the maximum opening clearance possible for your compartment by allowing the roll-up door to be fully opened. This can help increase staff efficiency during loading operations by giving them adequate room to maneuver—particularly when moving large or bulky cargo—and stops items from being damaged by striking a sagging door. E-coating is provided on all the device hardware, for enhanced corrosion protection and increased product lifespan. The 1184HD hold open device is a track-mounted positive stop assembly that holds the door open by physically preventing its closure. 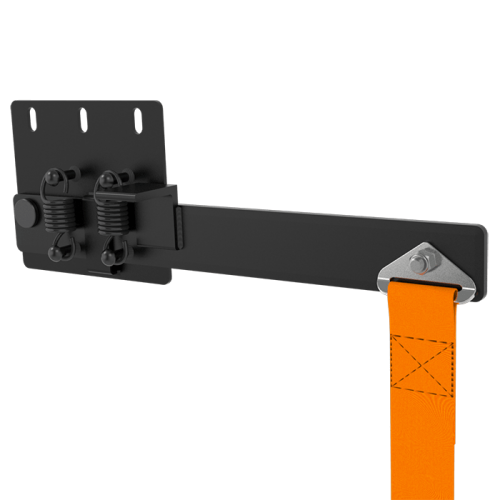 Ideal for heavier doors, this device is compatible with all WHITING® dry freight & specialty (including insulated) door models.